Arrgggh, swab the deck matey, and hoist the anchor! 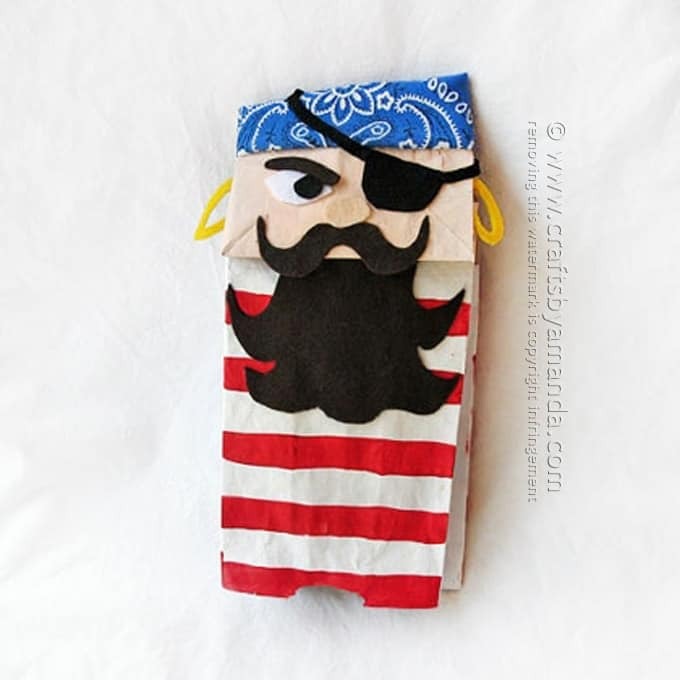 It’s time to make this cute paper bag pirate puppet and create your very own puppet show. Make this ornery little sailor and create a few more seamen (or even a parrot) to round out the crew! For added fun, glue two construction paper arms to the side of your pirate puppet and connect hands to a long dowel. Carefully move dowel up and down to control arms. To make a happy pirate puppet, glue the eyebrow in an upward slant instead of downward. If you prefer, you can replace the felt in this project with construction paper. You will need THIS PATTERN for this project. Lay lunch bag on work surface, bottom flap facing up. Paint the bottom flap with flesh colored paint. Paint the rest of the bag white. When white paint has dried, paint red stripes across the front and back of the bag. Use pattern to cut out felt pieces while your paint dries. You will need black for the eye patch and the pupil. You will also need to cut a thin strip of black felt for the band on the eye patch, about 8” long. Use brown felt for the moustache, beard and ponytail, goldenrod for (2) the earrings, white for the eye and peach for the nose. You will also need to cut a small ponytail holder (see ponytail pattern) out of light blue felt. Glue ponytail to the back of the bag first. Position the top of the hair about an inch below the top of the bag. Glue ponytail holder on to ponytail. Turn bag over so that the bottom flap is facing up. Lift the flap gently and glue the beard just under he flap. Glue moustache on next, overlap the bottom of the moustache over the bottom of the flap. You will need to cut ¼ out of the bandana. To do this, fold the bandana in half, and then fold in half again. You should have a square (4 squares folded together). Cut out one of the squares, set aside the remaining ¾ of the bandana for another project. Place the bandana square flat in front of you. The finished corner should be pointing downward. Fold the opposite corner (unfinished, cut corner) down to the finished corner, creating a triangle. Hold the bandana in place with your fingers and turn the bag and bandana over. Take the two loose ends of the triangle and tie them together, creating a do-rag. Glue do-rag in place, front and back. Flip the bag over so the pirate is face up. Glue the eye, pupil and eyebrow above the moustache; glue the eye patch on the other side. Glue the long thin black strip from one corner of the patch, around the head and back of the bag, to the other corner. Glue the earrings just inside the bottom flap of the bag (face), one on each side. Thanks for the cute inspirations!